Student Health Services' pharmacy is a full-service pharmacy located inside Redfern Health Center and staffed by licensed pharmacists who are available to talk with you about your medications. Our goal is to provide professional, confidential and courteous service to our students in a time-saving environment at cost-effective, competitive prices. We fill prescriptions from both Student Health Services providers and non-campus providers. We offer a wide selection of medications most commonly used by the college student population, including prescription and over-the-counter medications. We are also willing to order medications that you need but are not part of our normal inventory. Please note: Our pharmacy at Redfern is a preferred pharmacy for the Clemson Student Health Insurance Plan. Here, enrollees have no deductible and lower copays. We have several options to request refills 24 hours a day, seven days a week. Smartphone: m.mobilerx.net/redfern If prompted to enter a phone number, enter 864-656-3562. Then click "Submit." Call: 864-656-3562 Follow the Interactive Voice Response (IVR) prompts. We offer a wide selection of over-the-counter medications in our pharmacy at Redfern. 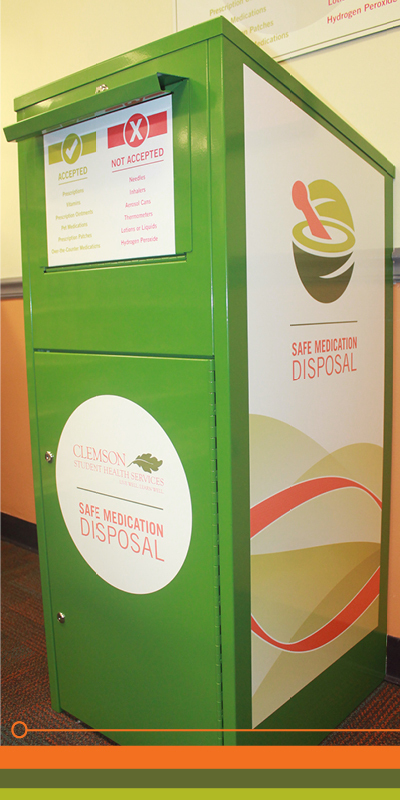 Safely dispose of your unused or expired medications in the drug take-back box, located in our pharmacy at Redfern. Why should I consider having my prescriptions filled at the Student Health Services Pharmacy? We are in the same building as the healthcare providers, so you can have your prescriptions filled without leaving the building. If there are questions about your prescriptions or any changes that need to be made because of concerns or insurance requirements, we can talk with the provider right away. In most cases, we can make needed changes while you are on-site, and you still leave with your prescriptions filled. We are there to make sure that students receive needed medications as quickly as possible so that they can start treatment as soon as possible. What information will the pharmacy staff ask me? We will verify your name, address, XID number, date of birth, drug allergies and pharmacy insurance information. Will the Student Health Services Pharmacy fill prescriptions from my private off-campus physician and/or refill prescriptions filled at other pharmacies? Student Health Services' Pharmacy can fill prescriptions written by Student Health Services physicians and/or private off-campus physicians in South Carolina or other states. We also accept e-prescriptions from the Sullivan Center and from any office with e-prescribing authority, including controlled substance prescriptions. You may bring us your original prescription or your physician may call us at 864-656-3562, fax us your prescription at 864-656-2500 or e-prescribe your prescription. For transferred prescriptions (those originally filled at another pharmacy), we must call the original pharmacy. To do so we will need your prescription number from your label, phone number of the pharmacy, your name and date of birth. A valid government-issued photo ID is required for all controlled-substance prescriptions, so please bring your ID with you. How long does it take to have my prescription(s) filled? Generally, the pharmacy is less busy from 8:30–10 a.m. and 12:30–1:30 p.m. We suggest you call ahead for refills. Most prescriptions can be filled in 15 minutes or less, depending on the number of prescriptions you have to fill and the accuracy of your insurance information. We do have a system to help us find your insurance information, but it is always best to have a copy of your most current prescription insurance card with you because this information may change on a yearly basis or after a job change. In what order are prescriptions filled, and why do some patients have to wait longer than others? The pharmacy fills prescriptions in the order they are received. Some patients have multiple prescriptions, have insurance problems, the pharmacist might need to consult with the physician about a potential problem with the prescription, or a patient may need additional counseling by the pharmacist. All of these things may make your wait longer. Generally, it takes less time to refill a prescription than it does to fill a new prescription. The pharmacy staff is working as quickly as possible to accurately fill your prescriptions, checking for potential drug interactions and/or drug allergies, following all laws and regulations, and making sure that you feel comfortable with the medication that you are given and have had all of your questions answered before you leave the facility. We care about your health and will fill your medications as quickly as possible, but we want you to feel confident that you have received the best professional and complete service possible. Nothing is as important as your health. We do not put other people ahead of you, but it could take less time to finish one refill than it does three or four new prescriptions. Will the pharmacy notify me when my prescriptions are ready? Yes, you may sign up for text messaging notifications. It’s quick and easy! Enrollment forms are available at the pharmacy windows and check out. Ask a staff member for assistance the next time you visit the pharmacy. Can someone else (roommate, friend, family member, etc.) pick up my prescription(s)? If the student calls us and gives verbal consent, which must include the person's name and relationship, it can be picked up by a third party. Does the pharmacy accept insurance cards? YES; the pharmacy accepts many commercial insurances for prescription medications, in addition to the Clemson University Student Insurance Plan for undergraduate and graduate students and their spouses. If you have your insurance card and would like to give your information to our pharmacy, please print and fill out the Pharmacy Prescription Card Information and fax it to 864-656-2500, drop it off at the pharmacy inside Redfern Health Center, or give it to a pharmacy staff member at orientation. This will make it easier and faster for us to process your prescriptions on insurance. There have been many changes to prescription insurance plans. The pharmacy staff is here to help you answer your questions, but the more you can learn about your coverage the better. What if you do not know your pharmacy insurance information? The staff at the Student Health Services Pharmacy can locate most pharmacy insurance information using your home address and zip code. You may also have someone who knows the information fax it to 864-656-2500 or text it to your cell phone. Why does the pharmacist discuss my medication with me after filling it, when the physician has already discussed it with me? The staff at the Student Health Services Pharmacy wants to make sure that all of your questions about your medication have been answered prior to your leaving the pharmacy. Also, it is a federal law that pharmacists must offer to counsel patients on all new prescriptions. The patient has the right to refuse counseling. There are several options available for payment. A student can charge the price of his/her medication to his/her University account. All accounts must be settled prior to the next semester or graduation. Other forms of payment include Tiger Stripe, Visa/MasterCard/Discover/American Express credit/debit cards, checks or cash. Will the pharmacy automatically refill my medication? The automatic refill process can make refilling and/or transferring a prescription difficult and time-consuming for the student. This is especially true during holidays, breaks and summer. Therefore, the pharmacy staff works with each individual patient to ensure they can obtain their medication during these times without issues. For your convenience, students have the capability of refilling prescriptions via telephone, mobilerx and online 24 hours a day. I'm going away for the break (summer, holidays, semester, etc.). How can I be sure to have enough medication? You might be able to purchase multiple months of refills on certain medications (ex: birth control pills). The pharmacy staff will be glad to help you with this. Can anyone have prescriptions filled at the Student Health Services Pharmacy, even in the summer? Continuing students (those returning next session) and Bridge students can have medications filled at the Student Health Services Pharmacy, even during the summer months. Once you have graduated, you can ask the pharmacy of your choice to call us at 864-656-3562, and we will be glad to transfer your remaining refills to them at no charge to you. Does the Student Health Services Pharmacy carry all types of medications? The Student Health Services Pharmacy has a formulary of medications that have been selected by and are continually updated by the medical and pharmacy staffs to meet the needs of the college population. If you have a prescription for a medication not found on our formulary, it can be ordered for you if you request it. The pharmacy staff will advise you on price and other important facts concerning the medication prior to your making the decision to order it. Our pharmacy is registered with the IPLEDGE program. If I charge my prescription(s) and other Student Health Services expenses to my Student Account, will my parents see the charge on my tuition bill? Unpaid Student Health Services charges are included on your tuition bill as an “Unpaid Redfern Charge.” This non-specific title will be the only reference to charges from Student Health Services. Specific medication names, labs tests, etc., will not be included in the description. Pseudoephedrine products may be purchased only at the pharmacy. If you do not have a prescription for a pseudoephedrine product, the Combat Methamphetamine Epidemic Act requires: storage behind-the-counter in the pharmacy, limits on quantities, photo identification and signature of the purchaser 18 years of age or older. Some of the most common products are: Sudafed (short-acting and long-acting formulations), Mucinex-D, Zyrtec-D, Claritin-D, Allegra-D and their respective generics. How can I purchase the emergency contraceptive? Emergency contraceptive (Plan B or EContra EZ) is available in our pharmacy without a prescription. Some insurance companies cover the cost of emergency contraceptives in limited quantities with a prescription. Ask pharmacy personnel for details on receiving a prescription. Does the Student Health Services Pharmacy sell over-the-counter products? Yes, the pharmacy has a variety of products available without a prescription. These products include medications for relief of pain, colds, coughs, allergies, nasal congestion, sore throat, GI problems, acid reflux and other conditions. We also have many miscellaneous items normally found in drug stores such as shampoo, contact lens products, feminine hygiene products, vitamins, even nail clippers and wax for braces. Our prices are very competitive with off-campus pharmacies and are lower in some cases.